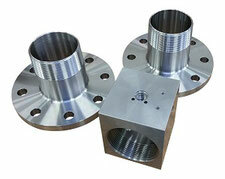 Mechatest Inline sampling solutions - Flow Thru Liquid Sampler typical for pipeline and loading arm sampling. The inline flow thru sampling system consists of a full flow process diameter sample valve that allows for continuous flow through a pipeline. 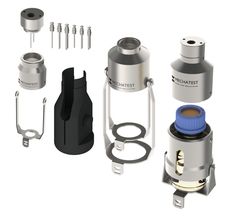 Easy to install and operate, the sample flows into the sample bottle by opening a needle valve. 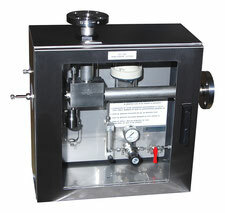 The inline flow thru sampler can be used in a lot of applications but mostly mounted into piping systems, this type of sampler is the best solution for loading arm sampling. 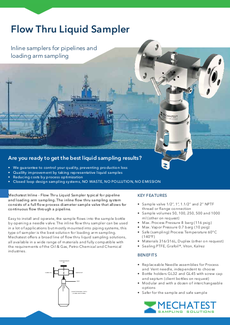 Mechatest offers a broad line of flow thru liquid sampling solutions, all available in a wide range of materials and fully compatible with the requirements of the Oil & Gas, Petro-Chemical and Chemical industries. 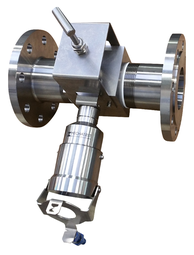 Sample valve NPT thread or flange connection 1/2", 1", 1.5" and 2"
The flow thru sampling system consists of a full flow process diameter sample valve that allows for continuous flow through a pipe line. 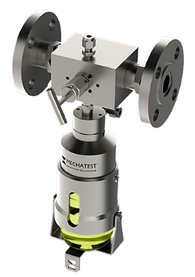 Against the competition the Mechatest flow thru sampler body and valve is made from forging 316/316L bar material or higher grade Alloy with the advantage that both mechanical properties and corrosion resistance are much higher to those of the “equivalent” wrought grades. 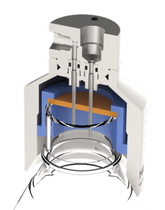 The rising stem sample valve allows the operator to control the flow of the sample being dispensed into the sample bottle. Rising stem needle valve with Ceramic stem ball tip Al2O3, superior hardness prevents deformation of the sealing tip and wear, significantly increasing the lifetime of the product for isolation purposes. This system can be used for medium pressures, temperatures and high viscous fluids where a continuous flow loop is needed. 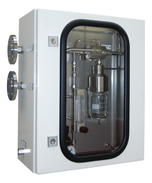 This flow thru sample valve is mostly combined with our ECO Needle Sampler with glass bottle, the process pressure pushes the sample through the valve into the bottle via a sample needle. Optional with Process Needle Purge connection, zero dead volume is ensured. 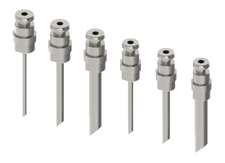 Replaceable Needle assemblies for Process and Vent needle, independent to choose in smaller or larger sizes.